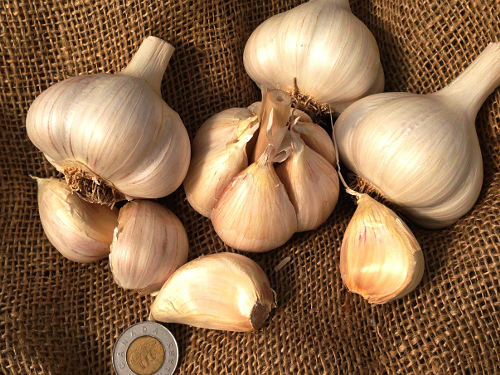 A beautiful large porcelain garlic from Chiloé Island, off the coast of Chile. It is actually so big that it is sometimes confused with elephant garlic. Bulbs can get up to a quarter pound, easily filling a hand. But its flavour is hotter and spicier than the elephant variety and it is used to make a famous garlic puree called Ajo Chilote. Chiloé Island is a very special place in the history of food plants. When Charles Darwin visited in 1834 he noted with astonishment the hundreds of varieties of potatoes that the Huilliché Indians cultivated on the island. The island has since been recognized as a centre of agro-biodiversity and along with its potatoes, is famous for its unique garlic and strawberry.